Earlier this year I had the pleasure of visiting Cat Town Cafe in Oakland, CA, officially the first cat cafe to open in the United States. The cafe opened in 2014 as an extension of the already thriving Cat Town Oakland, a non-profit organization started in 2011 and focused specifically on rescuing shy, senior and other at-risk cats. Because Cat Town works primarily with cats that would otherwise be considered “unadoptable” I was excited to get a tour of the cafe and see how they have designed the space to accommodate this particular population. Older cats and special needs cats with the rescue usually stay in foster homes while the cats that are at the cafe are carefully monitored to make sure everyone is doing well, plus the environment is very well Catified. Let’s take a tour! Upon entering, visitors are greeted with a series of informative signs explaining how Cat Town is run and outlining the rules for visiting with cats in the cafe — always a good idea for any cat cafe. The main cat room, known as the Cat Zone, is a big open space with large windows and lots of natural light. It’s really a perfect space for both cats and people to hang out, plus people passing by can look inside and see the cats during the day, a great way to draw in potential adopters! The Cat Zone is filled with incredible custom cat structures designed to look like famous buildings in Oakland. These are really some of the best cat structures I’ve ever seen. Not only are they adorable, but they function very well for the cats. Part of the reason for Cat Town’s success in working with this more challenging population of cats is that, over the years, they have consulted with certified cat behavior consultants Mikel Delgado and Dilara Goksel Parry from Feline Minds. 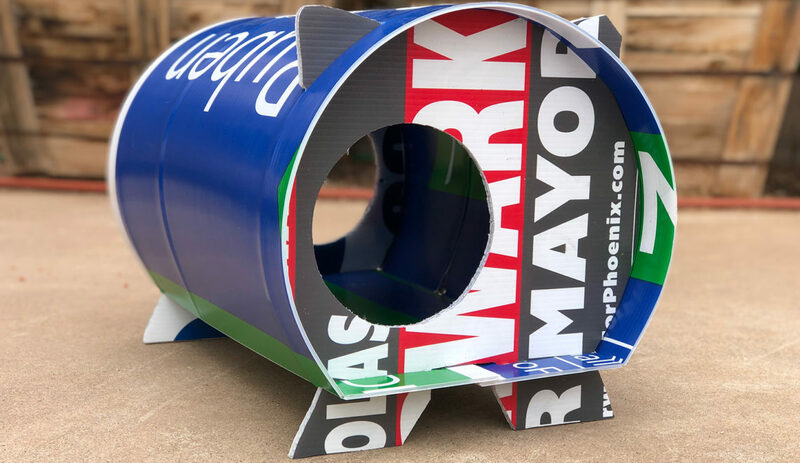 Mikel and Dilara were involved in designing the Cat Zone as well as the cat structures, making recommendations to help the structures be more cat-friendly. As you can see, there are always multiple openings so cats won’t feel trapped, and the structures are only as tall as can be easily reached by staff and volunteers. Clearly, the cats approve of the design! AND LOOK AT THIS TACO TRUCK!!! An important part of the Cat Zone is the Quiet Zone, a space that offers a bit more privacy for cats who might be feeling overwhelmed by the cafe environment. This small room off to the side of the main space has a six-room house that cats can access from the front or the back, again preventing the feeling of being trapped. Cats can retreat to this quiet space to take a break or grab a cat nap. Feline Minds recommended that the room have multiple entrances, so additional holes were cut in the wall allowing cats to come and go freely. As a backdrop for the cat structures, large colorful murals by Fuming Gorilla Productions cover the walls with images from Oakland and the Bay Area as well as whimsical cartoon animals. There are also some very creative Catificaiton Hacks in the Cat Zone. Basic IKEA cabinets have been turned on their sides and used to create these fabulous cat climbing structures. You enter Cat Town through the actual cafe, where you can purchase beverages and snacks. The cafe portion of Cat Town has changed a bit since I was there and is now the RAWR Coffee Bar selling all natural raw cat food and treats made by RAWR in addition to human refreshments. When I was there you could also pick up all kinds of fun souvenirs, including cat-themed t-shirts, tote bags, patches and the Hoodcats Calendar from Cat Town Cafe co-founder Adam Myatt, aka The Cat Man of West Oakland. If you’re ever in Oakland, please make sure to stop by Cat Town Cafe for a visit! In fact, you should plan a trip just to go see them! First photo by Cathy Niland, Cat Town; all other photos by Kate Benjamin. NekoHut Flash Sale! $50 Off and Free Shipping Today Only! Tune In to The Community Cats Podcast! I am astounded, astonished, amazed and generally blown away by this incredible place! At times I was brought to tears by the unmistakable love and respect for cats…and other of God’s precious creatures no doubt…that inspired the creation of Cat Cafe. As a lifelong rescuer and guardian of many gorgeous felines, it warms my heart that you provide this level of care to cats that are considered to be “unadoptable”. May God and Saint Francis bless everyone associated with this project. This is just amazing. I’m speechless.